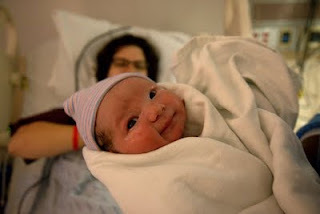 Benjamin Colin came into the world at 5.53 am, September 11, 2009. He weighed in at a mighty 9 pounds 14 and a half ounces. I watched him come into the world, and I marveled. Congratulations! Such a marvelous moment indeed. Best of luck!